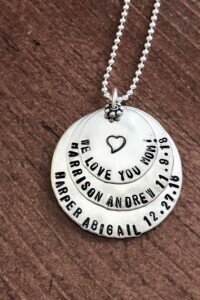 Home / Archive by category "Mothers Jewelry"
Personalized mother’s necklace hand stamped with ‘we love you mom’ and the names and birthdates of her children. Customize for a mom of two or mom of three to cherish. 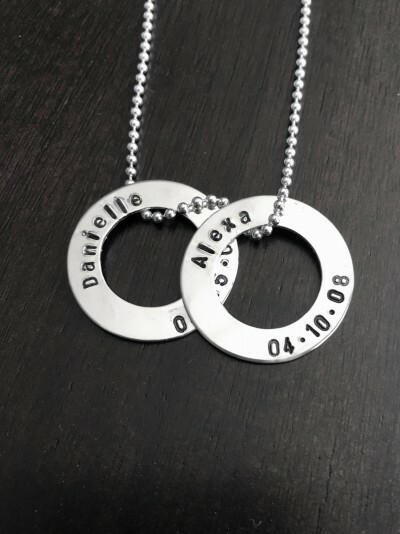 The sterling silver necklace includes three layered circle charms hand stamped with a child’s name and birth date or heartfelt phrase. Shop K&S Impression’s Mother’s Jewelry Collection today for an assortment of necklaces, rings and bracelets to wear close to heart. Looking for a baby gift for a new mom or grandma? 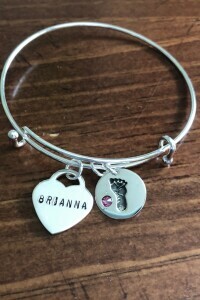 This sweet bangle bracelet with heart personalized with a name or birthdate is the perfect gift.. 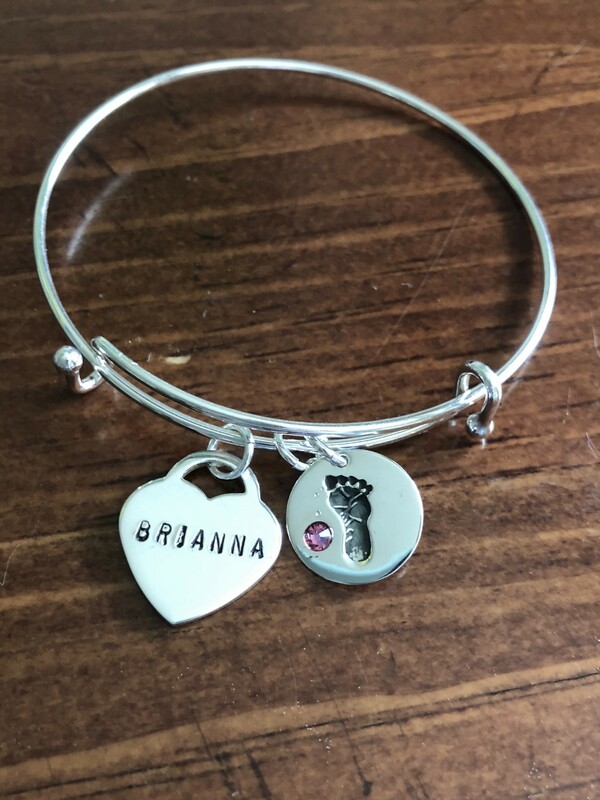 The sterling silver, hand stamped bracelet includes a signature heart charm hand stamped with up to 7 characters and a baby footprint charm with your choice of a pink or blue Swarovski crystal to represent a baby girl or goy. Shop our New Mother’s Jewelry Collection today. “You are my sunshine” is a heartfelt song for mothers and children. 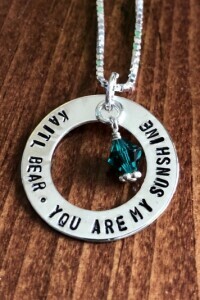 This custom mom necklace was personalized with her daughter’s name and ‘you are my sunshine’. 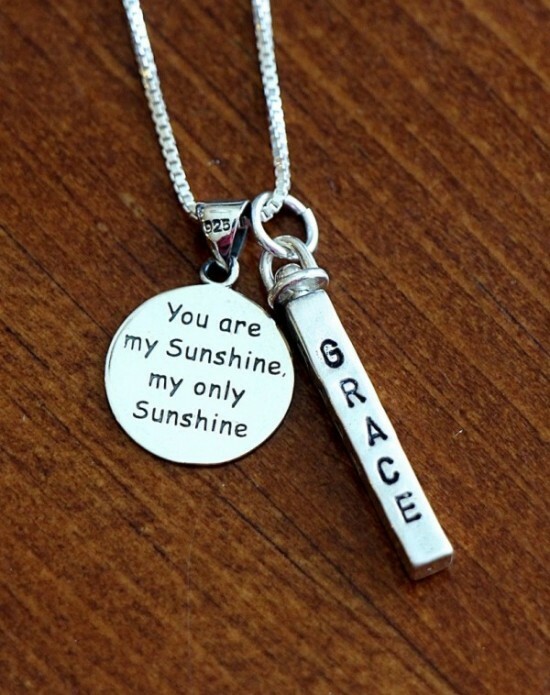 Personalize a sterling silver necklace with a birthstone, name or birthdate and You are My Sunshine charm. 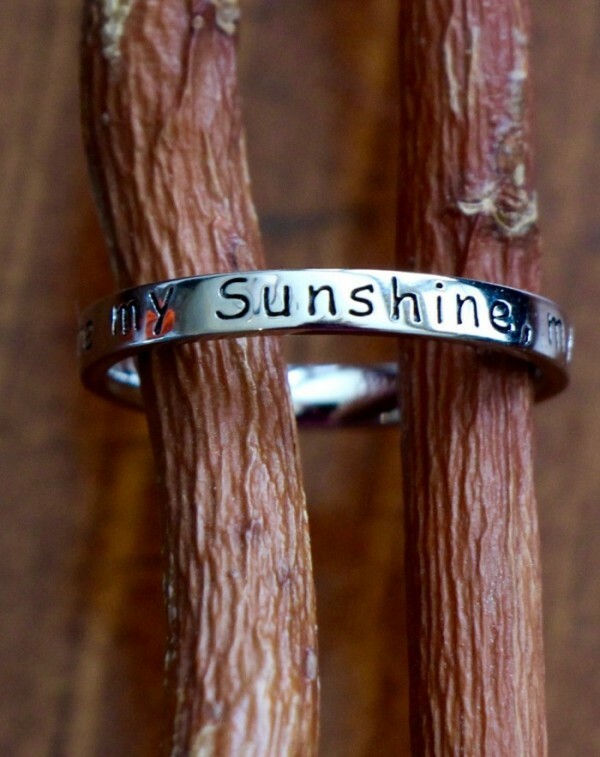 Shop K&S’s You are my Sunshine Collection today! Need help? Contact us at (913)583-0118 or kandsimpressions@gmail.com for assistance. We would love to help you find the perfect gift! 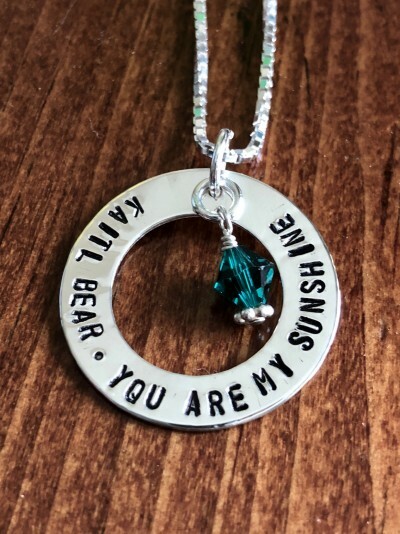 This new mother’s necklace was personalized with her baby’s name, birthdate and birthstone- a push present gift for a new mom to celebrate her bundle of joy and wear close to heart! The sterling silver, hand stamped necklace features a classic circle charm and your choice of pearl or Swarovski crystal birthstone. 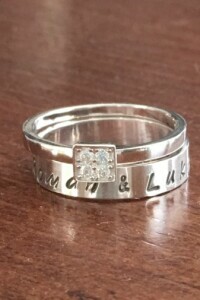 This mother’s family name ring was personalized for a mom with the names of her children and a square CZ stacking ring. 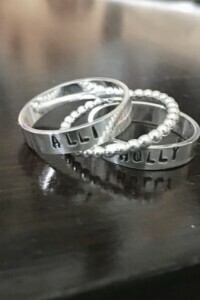 The sterling silver, hand stamped ring can be customized with up to 30 characters and is available in sizes: 5, 6, 7, 8 or 9. 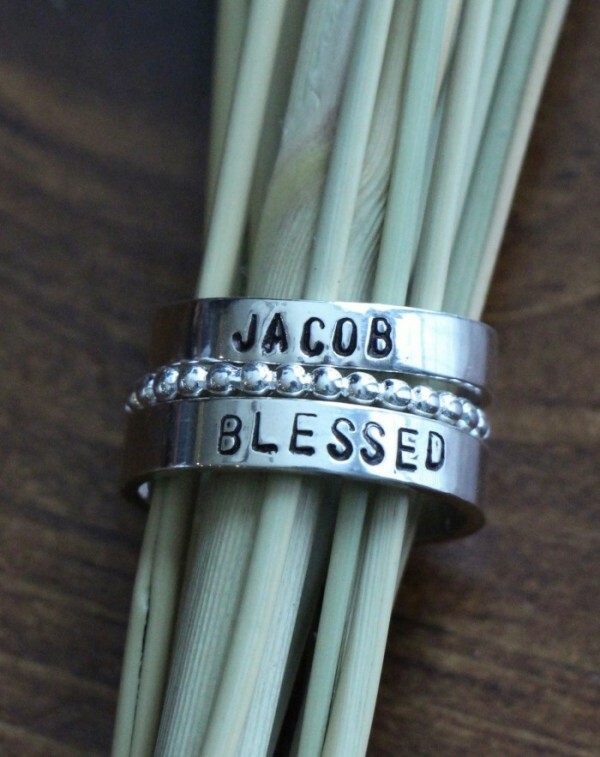 Shop our Personalized Ring Collection today. 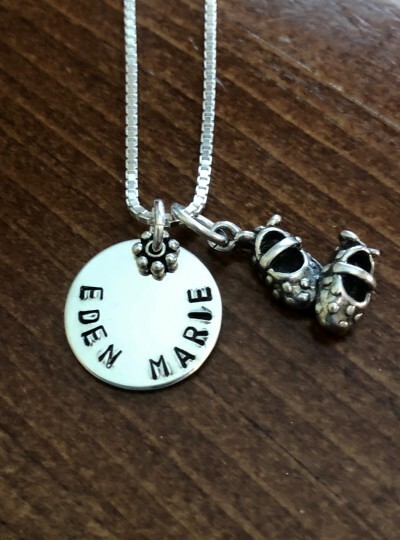 If you’re looking for a push present gift, this sweet baby girl name necklace was personalized for a new mom with her little girl’s name and baby shoe charm. 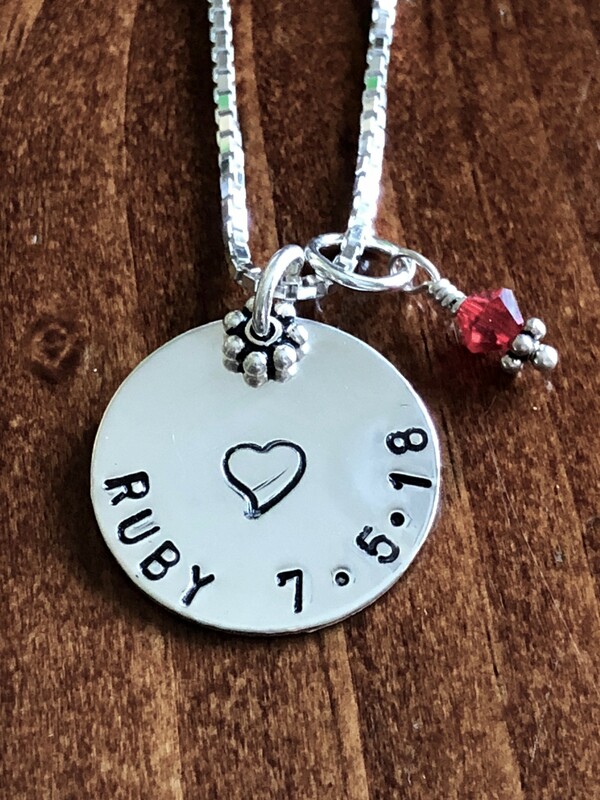 The sterling silver necklace includes a circle charm hand stamped with a name, monogram or birth date, baby girl Mary Jane shoes charm and optional Swarovski crystal birthstone. This religious cross necklace was personalized for a mom of two with her kid’s names- beautiful way to keep your faith and family close to heart. 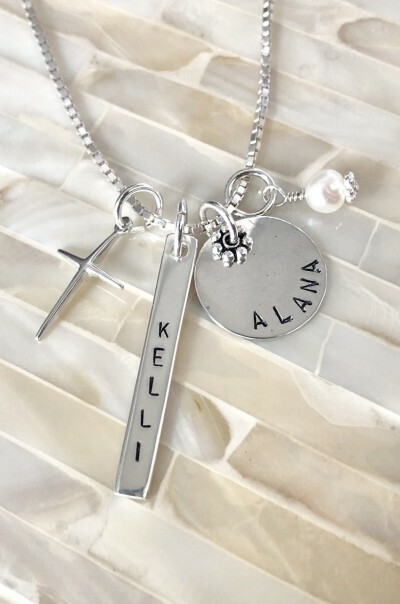 The sterling silver necklace includes two hand stamped charms, a name bar and circle, a cross and your choice of pearl or Swarovski crystal birthstone. Shop K & S Impression’s Religious Jewelry Collection today. 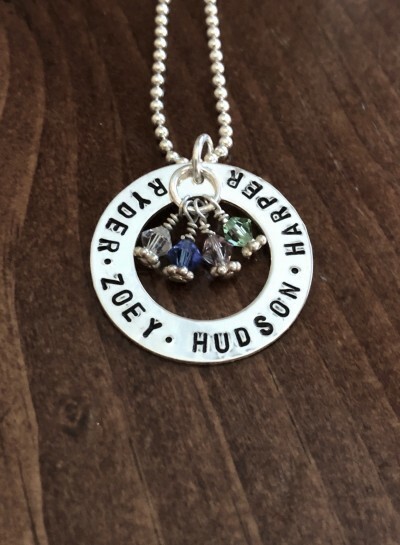 Sterling silver, hand stamped kids name necklace with birthstones was personalized with the names of four children for a mom or grandma to wear close to heart. This washer pendant allows up to 22 characters. 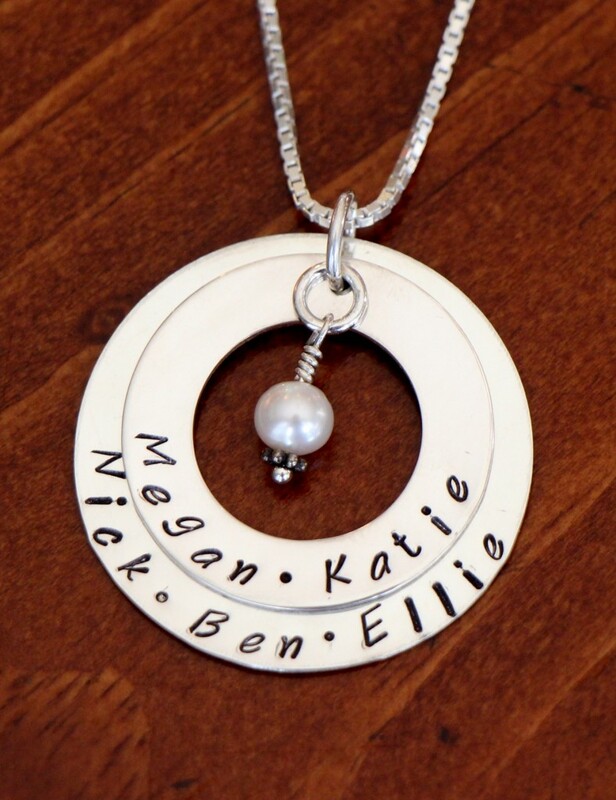 Larger families may chose this Circles of Love Family Name Necklace- the layered washer pendants allow up to 38 characters. 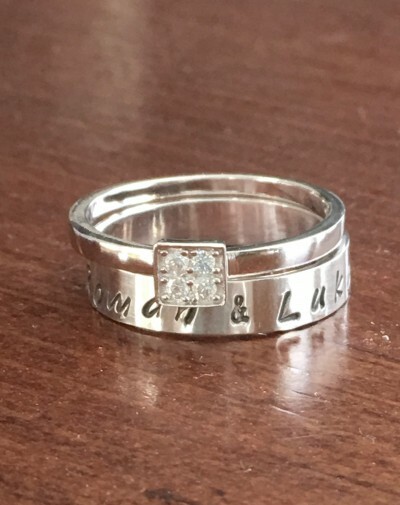 This stackable mothers ring with kids names was personalized for a mom of two. The set includes two hand stamped bands and a beaded spacer. 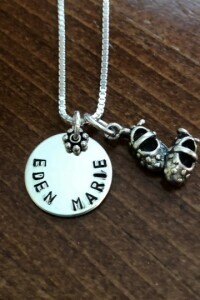 Customize for a mom of one with her chid’s name and birthdate. The sterling silver set allows up to 12 characters per band- available in sizes: 5, 6, 7, 8, 9. Shop K & S Impression’s Stackable Ring Collection today. 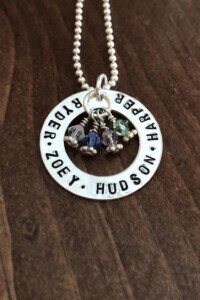 This mothers’s name necklace was personalized for a mom of two with each of her daughter’s name and birthdate. 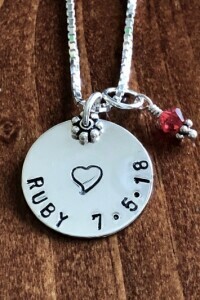 The sterling silver, hand stamped necklace has two layered charms and is a perfect gift for Mother’s Day, Christmas, new baby or push present. 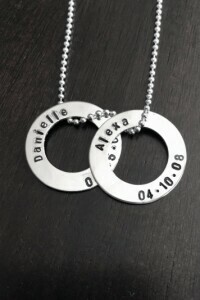 The circle washer charm measures 3/4″- birthdates will be stamped in 00-00-00 format. 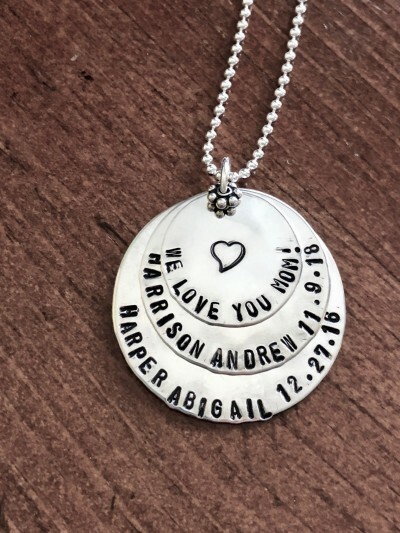 Additional charms may be added to represent everyone in your family.